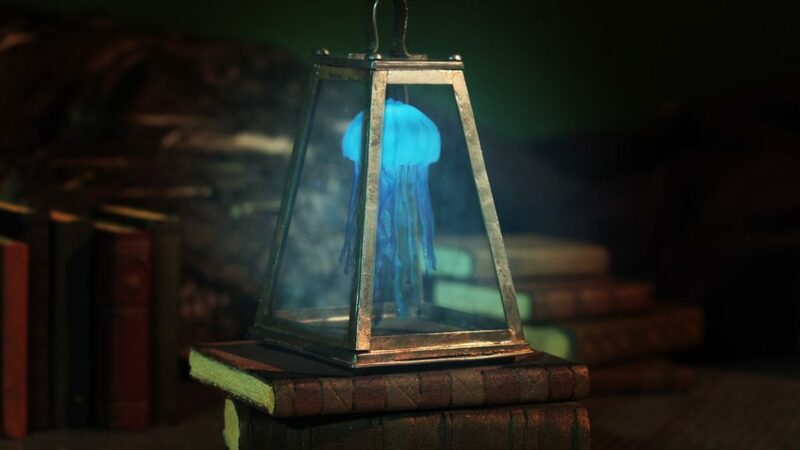 This luminous jellyfish is for a personal project in development. This puppet is still in development. On these pictures you can see the rig set up and some chroma key tests. 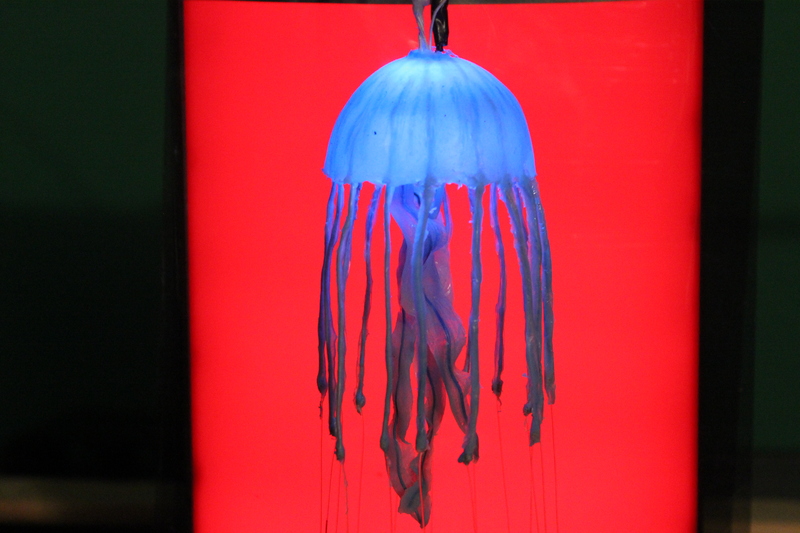 The puppet is made from silicone, with patterns painted into the mould and experimenting with the amount of pigment in the silicone to keep the jellyfish transclucent. 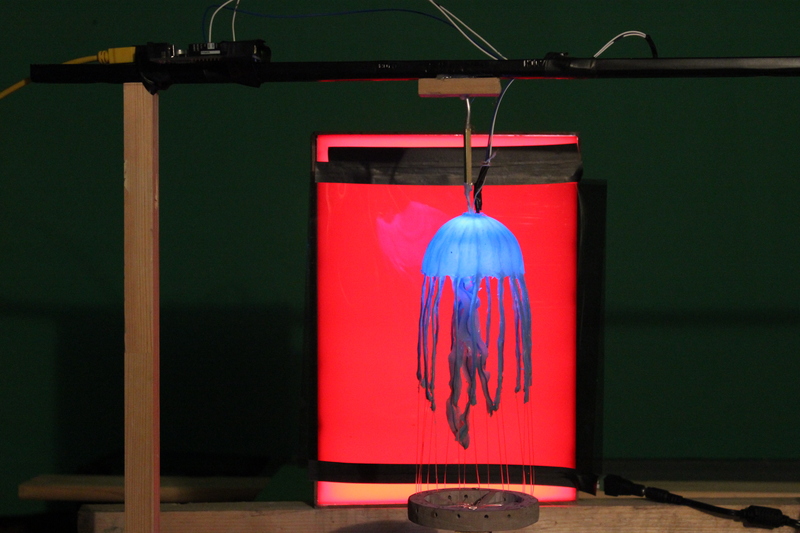 There is a Neopixel LED inside the jellyfish, with electrical wires connected to the Arduino coming out the top. I used Arduino software to program the LED to create a pulsating light that can be ‘animated’ frame by frame. 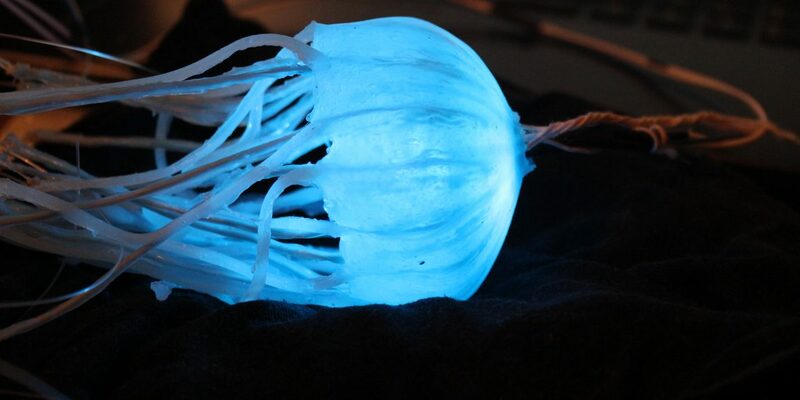 The jellyfish has wire inside going into each tentacle. The body can stretch and contract like a jellyfish when posed frame by frame. I built the rig underneath that is holding down fishing line attached to each tentacle to try keep them in place while animating. The red screen in the back is a lightbox I built, so the chroma key won’t need separate light and the screen can be moved around in moving camera shots. See image gallery below for more images and details about the fabrication process. 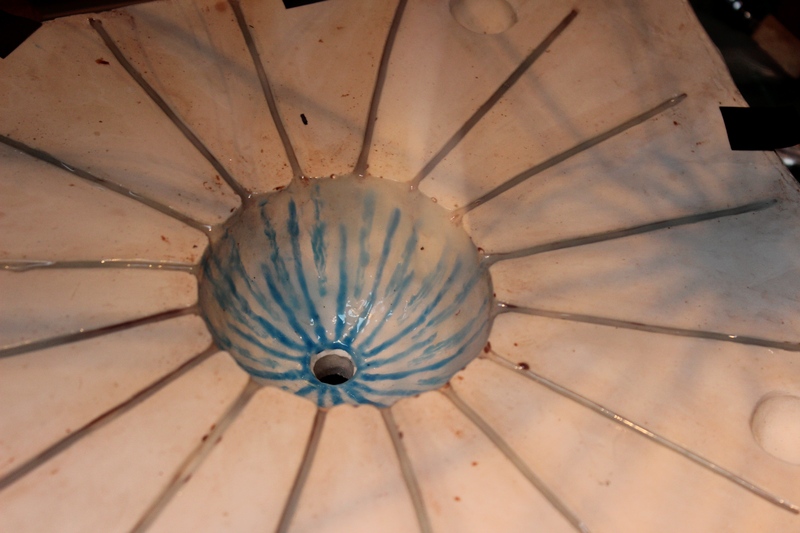 Painting in the outer layers of the jellyfish to create colour patterns in the silicone. 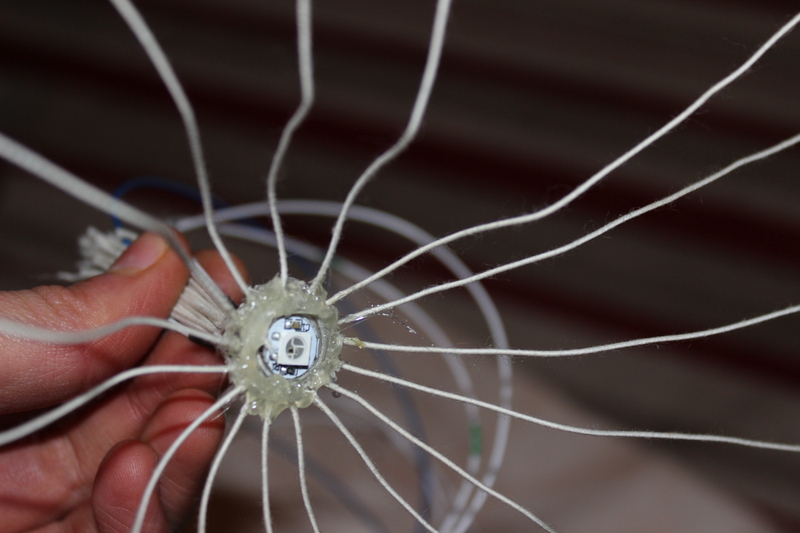 The wire armature of the jellyfish with Neopixel Led built in. Armature in the mould, testing out the Neopixel LED is still working (not final colour here!). 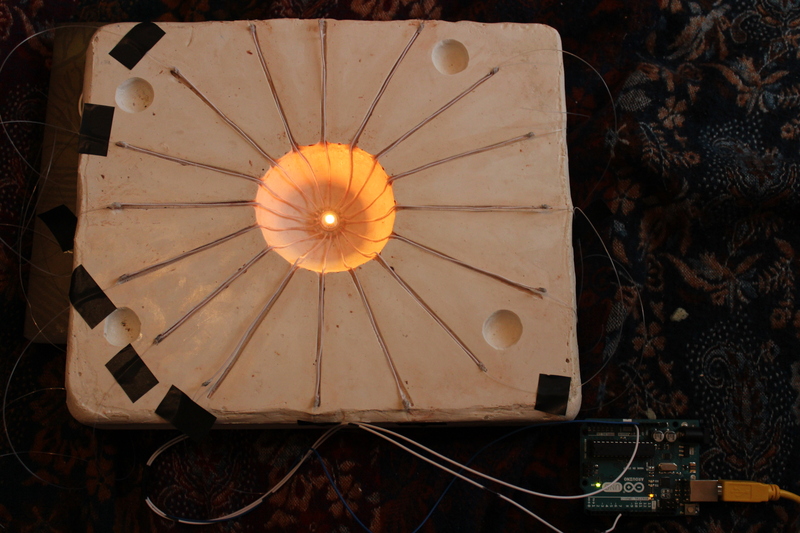 The wires of the LED go through a hole in the mould, here they are connected to the arduino at the side. Testing out opening and closing the jellyfish. Jellyfish set up on the rig. The rig at the bottom is holding all the tentacles down, at the top the wire is connected with K&S and cable is running to the arduino that is connected to a computer.